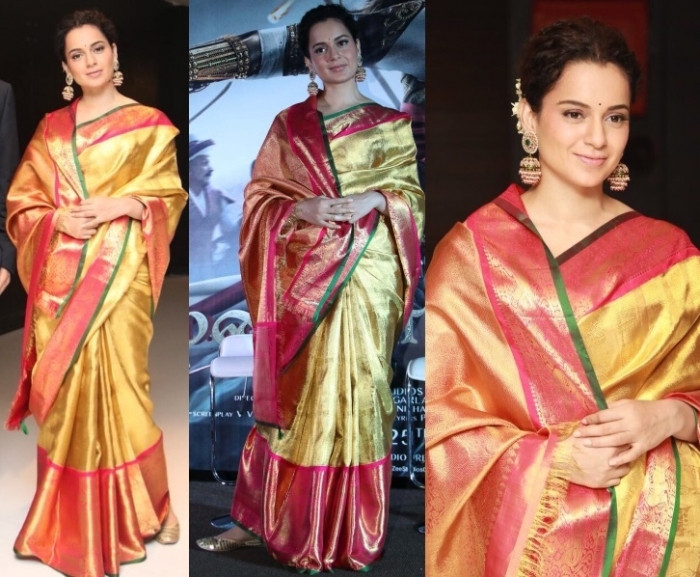 At the press meet in Chennai for Manikarnika, Kangana opted for another sari, this one a Kanjeevaram from Madhurya. Jhumkis and juttis finished out her look. You won’t find us complaining. 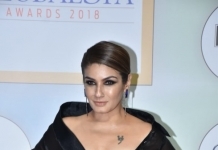 While attending another event in Guwahati for a liquor brand that she endorses, it was a three-piece power suit by Nikhil Thampi. She looked sharp in it. what a beautiful saree, on beautiful and elegant Kangana and how gracefully draped! I’m in LOOOOVE – that saree is divine; her drape is lovely (yes, messy but how many South Indians here have done this very thing?) and the jewelry and makeup are on point. Kangana looks soo gorgeous in that sari .. very exquisite and elegant! Oh my! Regular reader here but didn’t realize that “You won’t find us complaining” is your highest order of compliment. Well, then I am not complaining either :D :D Love what you do here, P&P! She looks fantastic in the saree. The drape is a bit messy, but it adds to the charm! The pics look as if she is glowing from within. Love! The suit however is not a favorite of mine. While she carries it off well, I feel it is a bit snug in the bust. Kangana’s style and personality bring such flair to her looks. The two appearances could not have been anymore different but how gorgeous is she in both outfits. Swoon! I love her in the saree. Yellow looks great on her. On a different note, while so many members of Hindi movie world are vocal about a recent rapper trailer, not one actress, actor, director had anything to say for Manikarnika trailer. I feel a bit sad how this woman has been sidelined by the industry. Kangana in sarees is a class act! It’s nice that she goes for these traditional weaves without always going for designer ones. I loved the trailer too and hope the movie does well. The film industry, media and PR nexus is too corrupt and dominated by insiders so outsiders like her are sidelined regardless of talent. Even recycled cop masala films are promoted by these people like path breaking movies ! Feels like we are back in the 80s and 90s. Pretty despicable .. one of the reasons why have almost given up on Bollywood movies. I agree. Its a pity, just because she speaks her mind and bought about the nepotism debate, she gets sidelined. Lets hope her work and her awesome fashion sense speak for themeselves ! She looks fantastic in both. Kanjeevarams are tricky, especially for shorter women on whom the material and the huge border look bad. Looking at her, I wish I could carry off these gorgeous sarees the way she does! Kudos. Love the power suit…wondering how a long jacket will translate in daily wear. Do you treat it like an outdoor jacket or wear it throughout? She looks lovely in the sari but I feel the fit of the suit is a little too tight. She’s incandescent in the sari. The jumpsuit is camel-toe central. Needed to size up.